Begin entering part of a number or user to search for in the search box or type a complete number or extension. To Transfer the caller immediately, click Transfer Now. The transfer will complete and your call session will end. If you want to first speak to the person you will be transferring to, choose one of the Attended options. This will keep the original caller on hold while you talk to the person you want to transfer the call to. If they are OK with accepting the transfer, click Complete Transfer. 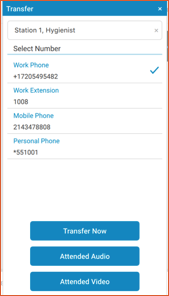 You can also transfer a caller to a contact’s voicemail by entering *55 followed by their extension, then clicking Transfer Now. If you search for a contact and you have added a transfer to voicemail string in that user’s profile (see article on Contact Management for creating a Voicemail contact), begin searching for the contact, then click the contact name to expand the list of calling options. 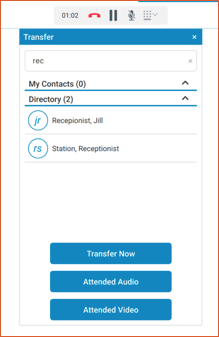 In the above, click on the Personal Phone field to use the transfer to voicemail string, then click Transfer Now.